Listen to Ralph Savarese's interview on NPR's "The Diane Rehm Show"
"Why would someone adopt a badly abused, nonspeaking, six-year-old from foster care?" So the author was asked at the outset of his adoption-as-a-first-resort adventure. Part love story, part political manifesto about "living with conviction in a cynical time," the memoir traces the development of DJ, a boy written off as profoundly retarded and now, six years later, earning all "A's" at a regular school. Neither a typical saga of autism nor simply a challenge to expert opinion, Reasonable People illuminates the belated emergence of a self in language. And it does so using DJ's own words, expressed through the once discredited but now resurgent technique of facilitated communication. In this emotional page-turner, DJ reconnects with the sister from whom he was separated, begins to type independently, and explores his experience of disability, poverty, abandonment, and sexual abuse. "Try to remember my life," he says on his talking computer, and remember he does in the most extraordinarily perceptive and lyrical way. Poet, essayist, translator, and scholar, Ralph James Savarese teaches American literature and creative writing at Grinnell College. He lives in Grinnell, Iowa. Savarese writes with passion and humor, careful to include extensive excerpts from DJ's typing, so readers get a sense of his remarkable growth. ...readers will find the elements documenting the foster care system worthwhile. This is... a story about what life is all about: trial, error, perseverance, and faith in people. Faith in love. Ralph, Emily and DJ give us that, and much more. Savarese’s careful melding of memoir and passionate advocacy for the disabled informs and inspires. 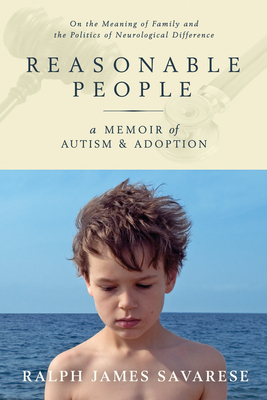 That [Reasonable People] manages to avoid both polemic and cliché is reason enough to applaud. A moving memoir, it calls for "living with conviction in a cynical time."